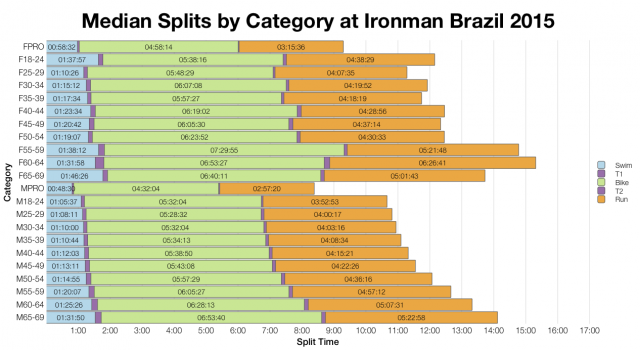 Another week and another Ironman Championship, this time Ironman Brazil took on the role for Latin America. 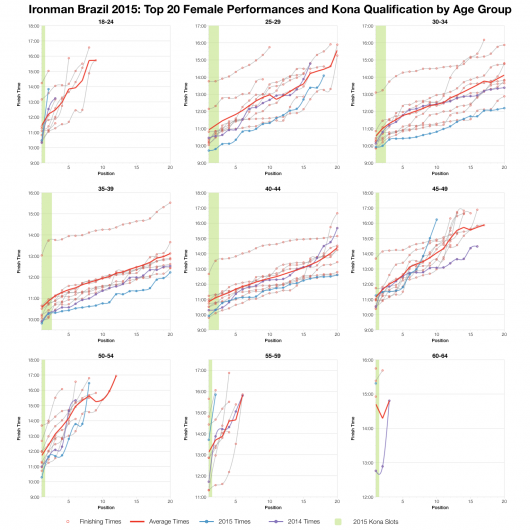 Like the other championship races the title comes with 75 Kona slots for age groupers, the maximum available at any Ironman event. Race day itself was fast – not just for the pros – with some of the fastest age group performances seen at this event. 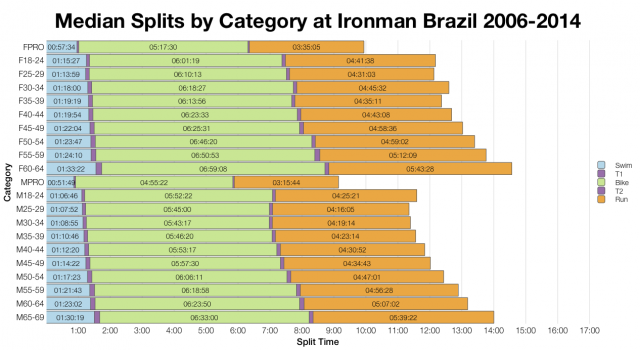 Comparing median splits back to previous races and while the 2015 swim was largely on par with past races, bike and run splits tended to be much faster. This is most obvious in the pro field where times dropped significantly, but it’s also evident across the majority of age groups too. 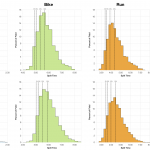 Bike times are most consistently lower which suggests conditions must have been favourable. Run times also show a dip too, so the benefits on the bike likely carried through to the run. 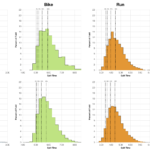 The same pattern of improved bike and run times is clear when we compare split distributions. The shift is most evident at the mid pack on both bike and run, with their respective median times around 10-15 minutes faster for the whole field. 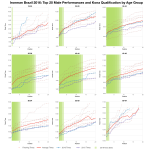 At the front of the pack, the top 5% there is still an improvement, but to a smaller degree. 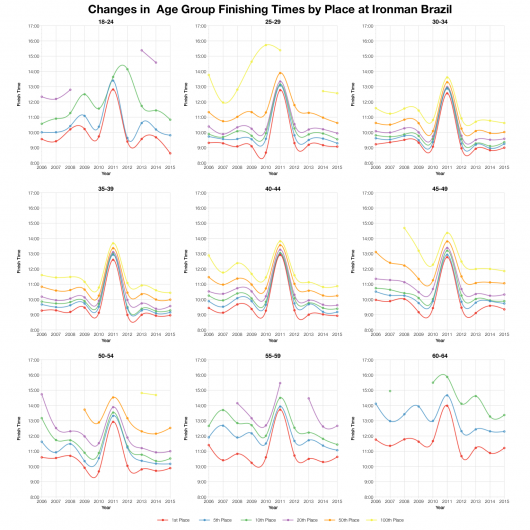 With both bike and run trending faster the finishing times naturally follow and the median here falls in the region of 30 minutes faster than the aggregate value. As I’ll note in the next chart there has been one slow year that perhaps helps drag the aggregate values down though. 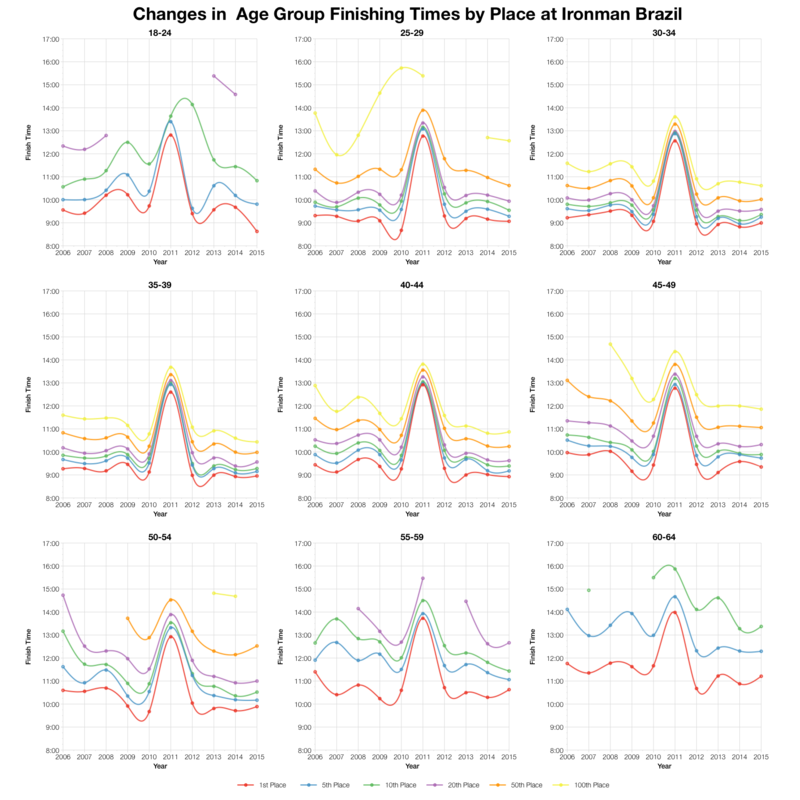 Checking times for different age group finishers over the last 9 years gives some sense of where this year’s race stands. Times for the last three year’s of racing are actually quite similar although in many cases 2015 does take the lead. It’s a close run thing with last year’s race though which was also noted as a fast running of the event. Of note is the exceptionally slow times in 2011, a blip for a race that otherwise looks to be trending slightly faster each year. 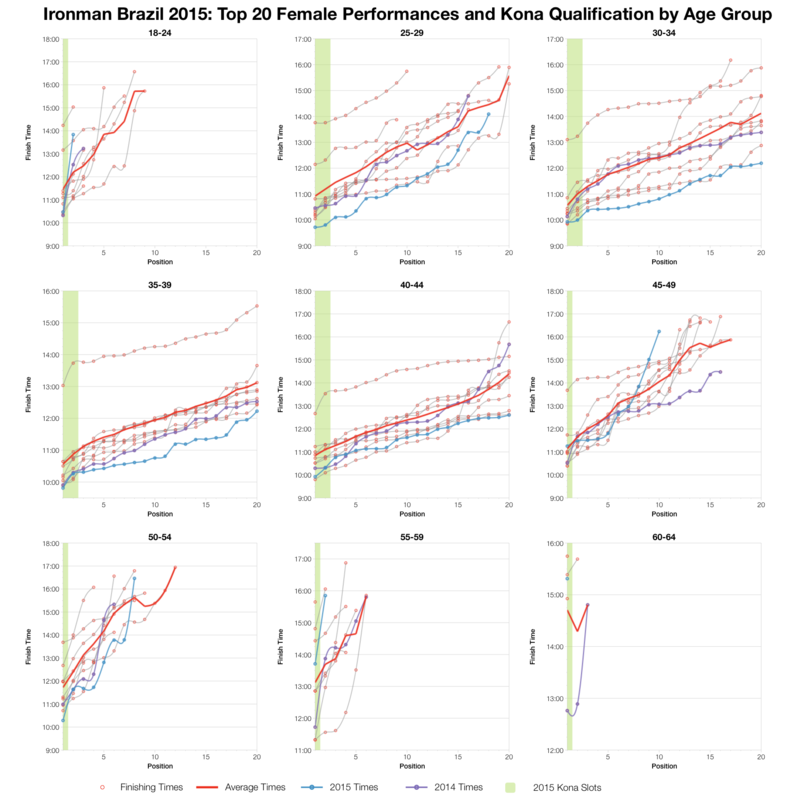 The front of each age group reinforces that 2015 was a particularly fast year, in many cases with times being the fastest seen at Ironman Brazil. 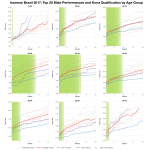 There’s some variation of course and some competition from 2014 results too. 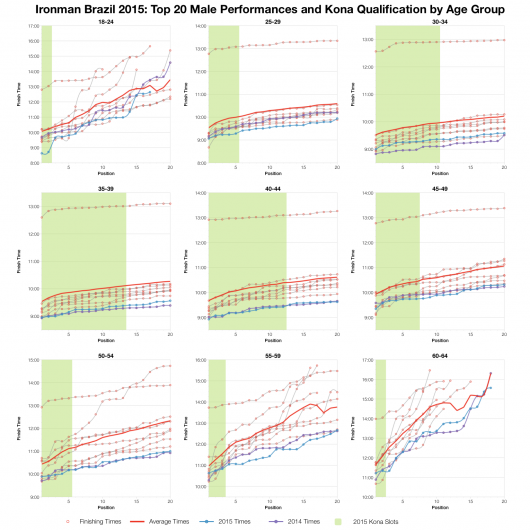 Kona qualifying times, particularly in the major male age groups are very competitive with little to distinguish first from fifth or tenth even. A handful of age groupers also dipped under the 9 hour mark. As usual a spreadsheet of the full results and splits from Ironman Brazil 2015 is available on my Google Drive.